"This is one of my favorite desserts that I get when I go to a Chinese restaurant. With this recipe, it is easy to make it in the comfort of your own home! Serve with some canned fruit cocktail with syrup or just some fresh fruit! It's such a refreshing dessert to enjoy and a very good change from plain gelatin." Pour 1 cup water in a bowl; sprinkle the gelatin over the water; stir until the gelatin is partially dissolved. Set aside. Bring 1 cup water to a boil in a large saucepan. Reduce heat to medium-low and slowly pour in the gelatin mixture. 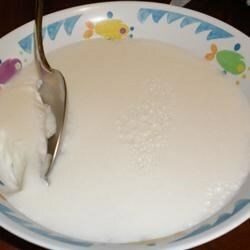 Add the milk, sugar, and almond extract; stir until the sugar and gelatin are completely dissolved; pour mixture into a large, shallow container. Refrigerate until firm, 3 to 4 hours. Cut into small squares to serve. Was good, but not something I'd make again. Cheap and easy. I grew up making this with my mom so it's such a nostalgic treat!! I substitute soymilk now since I've become lactose intolerant. Don't pass this up - it's so so delicious!! This is so good, so refreshing. I would suggest using the fruit cocktail with extra cherries "Very Cherry" I believe its called. I used whole milk, turned out perfect!